You’ll get excellent reception with the AmazonBasics Ultra (up to 50 miles from a broadcast tower), all in one discreet little device that has a paper-thin design and mounts out of the way for out-of-sight function. No more messy cords! Enjoy your favorite HD TV channels for free including ABC, CBS, NBC, PBS, Fox and many more, with over the air television that includes the most watched popular shows in the US. Use the AmazonBasics HDTV Antenna for large homes, small apartments, RVs, dorm rooms, studios, workshops or even while tailgating. Receive dozens of free HDTV channels with the AmazonBasics TV Antenna. This one-time cost means that you will enjoy month-to-month TV viewing without signing any contract or paying a monthly fee. If you’re tired of paying high monthly bills and wondering exactly what you’re paying all that money for, it’s time to cut the cord and stop paying for cable. Put your monthly cable payment on better use, or build a savings account. This hdtv antenna will deliver a better picture quality than with cable or satellite. Power amplifier is included to help you receive those broadcast stations that are up to 50 miles away from your home. Extremely long Coax cable will reach just about any place in your home without having to purchase additional cables. When you couple this with a dvr unit to record your shows you have the perfect solution to cut the cord. 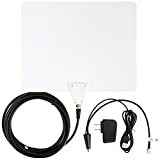 There has been a significant amount of negative feedback left for this product from customers who live in or around large cities and say they cannot pick up even one or two channels using the antenna. This was very disappointing, since the product was described as being able to pick up many channels. At least 35% of reviewers talk about having problems with the antenna that make it undesirable to own- everything from the product being broken upon receipt to its being made of cheap materials, which quickly broke, and customers who say that after only using a couple of times, cable fittings simply snapped off and had to be replaced. Another issue that buyers had with the antenna was with regard to the amplifier, with several customers stating that the amplifier did not work at all, and only made reception worse when they had it hooked up. Many customers mention that they were able to pick up a few channels without the amplifier, but none at all while using it. Along with the negative reviews were a large percent of buyers who really liked the antenna. 52% of customers left it a 5-star rating and talked about how much they liked the product. Many buyers discontinued their cable service after purchasing this antenna and saved a lot of money after buying it. Some users mention that they were able to pick up 35 different local channels for free. This is a popular antenna but has a bit of mixed feedback. Most of the feedback comes from people who do not have a clear line of site to the towers. Make sure you don’t have anything blocking the antenna or you can get the antenna in position that has a chance to receive the most powerful signal. Although more than half of the reviews were left from customers who absolutely loved the product and even stated that it worked far better than they thought it would, more than a third were from buyers who felt they had wasted their money on it, and could either not pick up a single channel, or were only able to pick up one or two channels. This product seems to be hit and miss, with the geographic location of where a customer lives having little to do with whether or not the product will work. Our most recommended digital antenna is the winegard FL5500a here.